The muscles which are required for mastication are known as the muscles of mastication, These muscles help mainly in the movement of the mandible and not the maxilla as maxilla is an integral part of the skull and the mandible being the only movable bone in the skull. 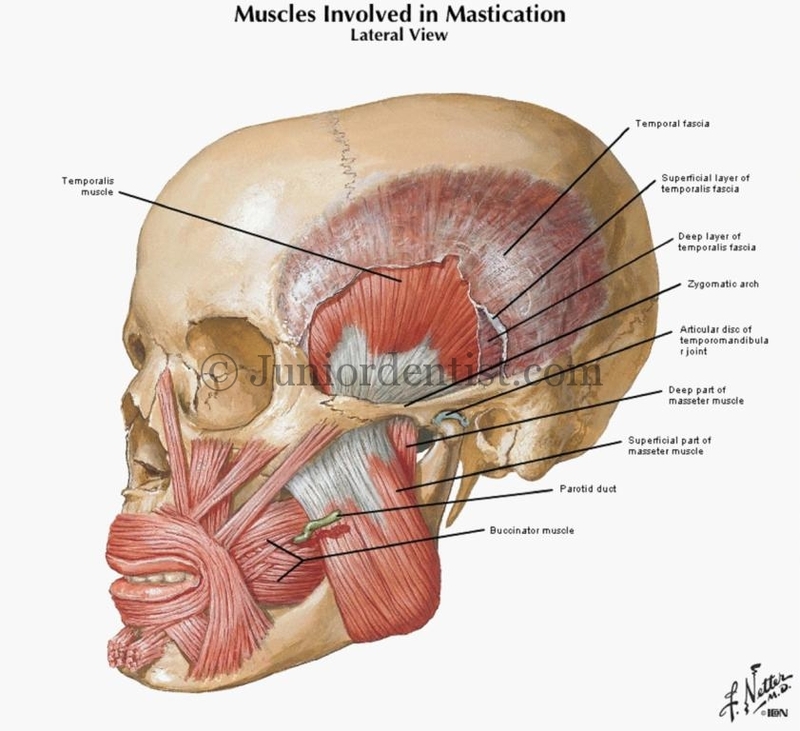 In humans, the masseter is the second most efficient masticatory muscle. Its origin and insertion make it very useful for the movement of the jaw and for applying good bite force for mastication. This is the muscle which helps in elevation of the mandible, It is one of the muscles of mastication. It is large shaped in appearance and covers the Temporal area of the skull. From the Parietal bone of the skull and is inserted on the coronoid process of the mandible. The Deep Temporal artery supplies the large muscle. Trigeminal nerve( this nerve has been associated with being the cause of Headache and migrane. Crushing of food between the molars. Posterior fibers draw the mandible backwards after it has been protruded. It is also a contributor to side to side grinding movement. Sudden contraction of temporalis muscle will result in coronoid fracture, which is rare. 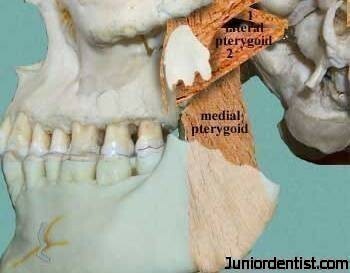 Pterygoid branch of Trigeminal nerve. Pterygoid branch of Maxillary artery. Lateral Pterygoid forms the roof of the Pterygomandibular space. The combined efforts of the Digastric and Lateral Pterygoid provide for natural jaw opening. It is a thick muscle of mastication. 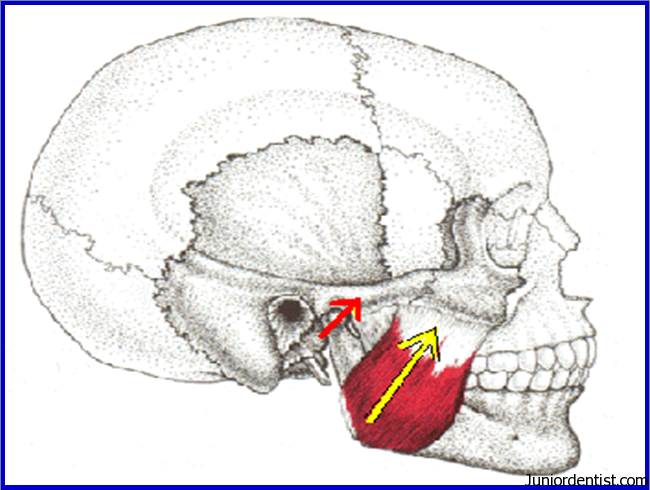 It Arises from the deep head the lateral pterygoid plate, and from the maxillary tuberosity. Insertion is seen on the Medial angle of the Mandible. Mandibular nerve through the medial pterygoid. Helps in side to side movement. What is MPDS? Also, is there anything else unique about the pterygoid muscles? THanks! PLease also try to email your response, not sure if I can find this site again! My lecturer was very impressed seeing my answer in the exam. What sensor nerve innervites the masticator muscules? Each of these primary muscles of mastication is paired, with each side of the mandible possessing one of the four. It is expanded to Myofunctional Pain Dysfunction Syndrome. As the name suggests it is a pain disorder, where certain points on the muscles of the head and neck when triggered lead to excruciating pain. It is mainly Unilateral (on one side of the face only). THIS POST WAS OF GREAT HELP….. The answer lies in the function of both the muscles, Masseter muscle as the name suggests plays a major role in Chewing food with your Molars of posterior teeth which requires more force and tension. The Temporalis muscle on the other hand, being larger in size and also having more surface area of attachment is only used to elevate or lift the mandible and does not put any force for chewing. So after a long duration of mastication, the masseter muscle which is smaller and applies more force on the mandible helping to chew any hard substances is more fatigued as compared to Temporalis muscle which only lifts the mandible. Your notes are incredible ?